GI Resistance Movement Continues to Grow! The GI Resistance Movement continues to grow in the U.S.! GI Resistance along with civilian support has the power to stop the war. Please support these resisters today! "I started to think ... what's it really for? I was willing to die for my country. I thought I was going over there to defend my country. But that's not what I was doing," Anderson said . "There are no weapons of mass destruction. Innocent people are being killed every day. It's a war about money -- to keep money in rich people's pockets. There is no way I can believe in that. I still believe in my country, but I can no longer be a part of the Army or that war." After enlisting in the Army in January of 2003 to earn money for college and serve his country, Darrell Anderson was deployed to Iraq with the Army's 1st Armoured Division in the spring of 2004. Darrell served most of his time in Baghdad where he was wounded by a roadside bomb after serving for 7 months. Facing the possibility of a second deployment to Iraq, Darrells conscience kept him from returning to the military. He fled to Canada rather than face that possibility. 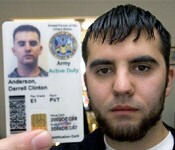 Now Anderson will return to the U.S. later this month to turn himself him to the military. "He feels that everything he did was a moral stand and he has to follow it through, which means coming back and facing it, telling everybody what's happening there, what's happening to soldiers and the innocent Iraqi people," said his mother, Anita Dennis, in a recent article published by the Toronto Star. Support is mounting for Darrell and his courageous stand! Fort Erie, Ontario on Saturday, September 30 at Noon. There will be a rally in Lions Sugar Bowl (corner of central ave. and gilmore rd.) and then supporters, including Iraq war veterans and military family members, will accompany Darrell as he crosses the border back into the U.S. over the Peace Bridge. On Monday, October 2 supporters will vigil outside of Ft. Knox, KY to demand an immediate discharge from the military. More details to come! On September 2, 2006 Augustin Aguayo, a conscientious objector, went AWOL after the U.S. military attempted to deploy him from Germany to Iraq by force. Aguayo is the first U.S. soldier stationed in Germany to publicly refuse deployment to Iraq, joining a growing group of U.S. military personnel who have refused to deploy. According to his wife, Helga Aguayo, Agustin plans to turn himself in as soon as it is feasible. 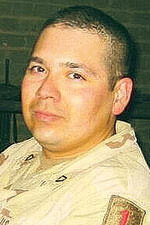 Aguayo had already served a year in Iraq beginning in February, 2004. He applied for conscientious objector status and release from the Army shortly after he first arrived in Iraq. Despite an initial favorable review of his CO application by Army interviewers, the Army denied his CO application in August, 2004. In November, 2005, Aguayo filed a civil court case in the U.S. District Court in Washington, DC, to challenge the Army’s rejection of his CO application. After stating that ,on the grounds of conscience, he would not deploy to Iraq again he received an order to deploy to Iraq for a second time. On the morning of September 2nd Agustin turned himself in to military police at the Schweinfurt military base ready to accept a court martial for his refusal to deploy, but the military attempted to deploy him by force. “I stand by my husband because I know he is sincere. I stand by him because I know he is right. God created all people, Christian, Muslim, Black, White -- no one has the right to decide when it is time to kill someone. When the unit tried to take him by force to Iraq, what was he to do? If he is truly a conscientious objector than the only thing he could do was resist. He is a conscientious objector, but the Army forced him to become a war-resister.” - Helga Aguayo, Agustin's wife. Please be ready to take action to support Agustin's courage! In one of the latest cases of a young man from within the military taking a powerful stand against the war in Iraq, Army Specialist Mark Wilkerson turned himself in to Fort Hood, Texas after more than 18 months spent AWOL from the Army. Prior to turning himself in, on August 31st, WilKerson held a press conference at Camp Casey in Crawford, Texas. 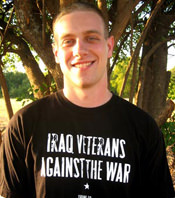 22 year-old Wilkerson was deployed to Iraq in March 2003, and after returning to the States immediately applied for Conscientious Objector status. With his C.O. claim still in process, Mark's unit was informed they would deploy to Iraq in January 2005. In November of 2004, two months before scheduled deployment, his C.O. claim was denied, and Mark was told by his superiors that his rebuttal would not be considered until his return from Iraq, more than 16 months away. It was at this point that Wilkerson made the decision to go AWOL, for what he describes as "political, spiritual, and personal reasons." Wilkerson is now at Fort Hood, Texas, awaiting review of his case. He faces potential court martial or other legal repercussions. Sgt. Ricky Clousing, who served as a U.S. Army Interrogator in Iraq in 2004 and 2005 has been charged with desertion by the Army and will face court martial charges. He was charged with desertion depite the fact that he turned himself in to military custody. Clousing left Fort Bragg, North Carolina where he was stationed in 2005 after returning from Iraq with the 82nd Airborne Division. He had been AWOL until August 11th, 2006, when he called a press conference in Seattle, Washingon coinciding with the annual Veterans for Peace national convention. At the press conference, Clousing went public with his stand, and later turned himself in to Fort Lewis military police. In response to charges related to his 14 months absent-without-leave, Ricky stated: "Since I left the army I have known that being court martialed was a possibility I could face. I am at peace with my decision. I followed my conscience and, if need be, I will feel honored to join the ranks of others who have been prosecuted for doing the same." The United States Army has opened two parallel investigations into disclosures made by Sgt. Clousing about the abuse of power and lack of accountability of the U.S. Military in Iraq. Clousing does not claim to be a conscientious objector, as is defined by the U.S. military, he is opposed to the war and occupation of Iraq based on his firsthand experience in country, which brought him to the conclusion that the Iraq war is a "war of aggression" that has "no legal basis to be fought"
Desertion charges can carry up to a 2 year jail sentence.